If you've ever felt overwhelmed while browsing the selection of scents at a candle store, maybe it's time to rethink your aromatherapy options. As Mashable reports, this fragrance device from Vapor Communications connects to your smartphone to release a symphony of distinct smells all from one place. 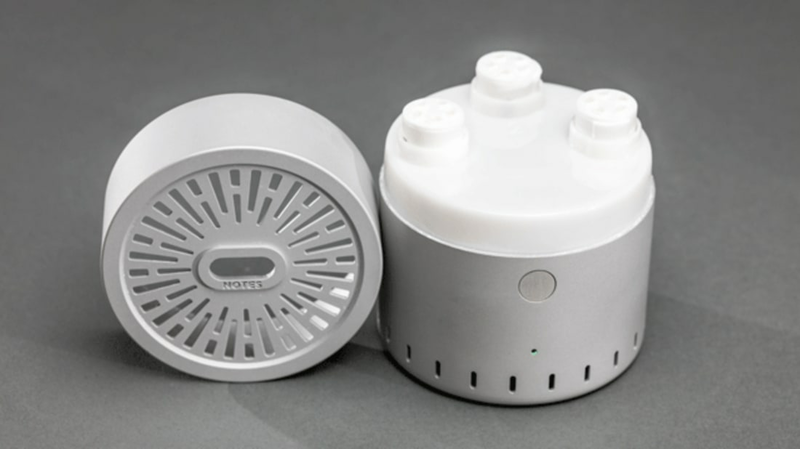 The Cyrano bills itself as a "Digital Scent Speaker and Mood Modification Platform." Small enough to fit in the palm of your hand, the stout cylindrical gadget can hold up to three scent capsules, which in turn contain four scents each. What sets Cyrano apart from other aromatherapy devices is its emphasis on variety. Users select different scent "playlists" on the device's companion app, with names like "Get Relaxed," "Get Energized," and "Get Away." The playlist releases individual smells for 35 seconds at a time before switching to a new one to prevent what the company's founder describes as "olfactory fatigue." In between each scent the device takes a 22-second pause to give your nose a break. Scents included in Cyrano's starter kit include orange ginger, guava, honeysuckle, suntan, and Venetian bellini. If sniffers don't like a certain scent and are particularly fond of another, they can add and remove them from within the app. While technology has done amazing things for how we interact with sight and sound, virtual scent experiences have proven harder to manufacture. But David Edwards, the Harvard professor behind Cyrano, has spent years paving the way for olfactory-focused tech. In 2014, he helped launch oNotes, which allows users to "message" each other scents through a device connected to an app. The company's latest gadget was unveiled this past Wednesday, and is available to purchase for $150 on the oNotes website.